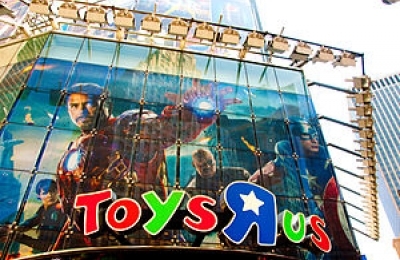 Marquee of the flagship Toys "R" Us store in Times Square, Manhattan as seen in 2012 Image: Dstlife. On Thursday, Charles Lazarus, the founder of United States toy retailer Toys "R" Us, died in Manhattan, New York, New York of respiratory failure. He was 94. His death came a week after Toys "R" Us announced that all of the stores were closing. Toys "R" Us issued a statement in which they said, "There have been many sad moments for Toys "R" Us in recent weeks, and none more heartbreaking than today's news about the passing of our beloved founder, Charles Lazarus. He visited us in New Jersey just last year and we will forever be grateful for his positive energy, passion for the customer and love for children everywhere. Our thoughts and prayers are with Charles' family and loved ones." Michael Goldstein, who was a close friend and former Toys "R" Us chairman, said: "He was the father of the toy business. He knew the toys and loved the toys and loved the kids who would shop in the stores. His face lit up when he watched kids playing with toys." In a phone interview Goldstein said that Charles Lazarus died in Manhattan. Lazarus no longer held a stake in the chain, CNN reported. Lazarus took over his father's bicycle repair shop in 1948 at the age of 25 and changed it to baby furniture. He opened the first Toys "R" Us store in 1957. Lazarus had remained its CEO until 1994.